Group-level properties or behaviours can also emerge or change rapidly over time or depending on the situation. This means that observations have to be made at high temporal resolution. To study social behaviour with group sizes that resemble those occurring in nature, we need new techniques to extract sufficient information from social groups. Birds are widely used to study sociality, both in the wild and in captivity. For example, zebra finches are a commonly-used model system for studying social behaviours such as song learning and mating. This is because they naturally live and reproduce in colonies and are well adapted to laboratory conditions. Most studies to date have relied on using colour bands to allow observers to tell which bird is which. For this method, each member of the group is fitted with a unique combination of plastic coloured rings on their legs. By recording the colours of the bands of a bird, an observer can record its identity. However, this approach is very time-consuming (for example often the observer can’t see both legs at once) and error-prone (for example humans often make transcription errors). The first major technological advance for collecting social data came from PIT tags (see Feederwatch for more information). 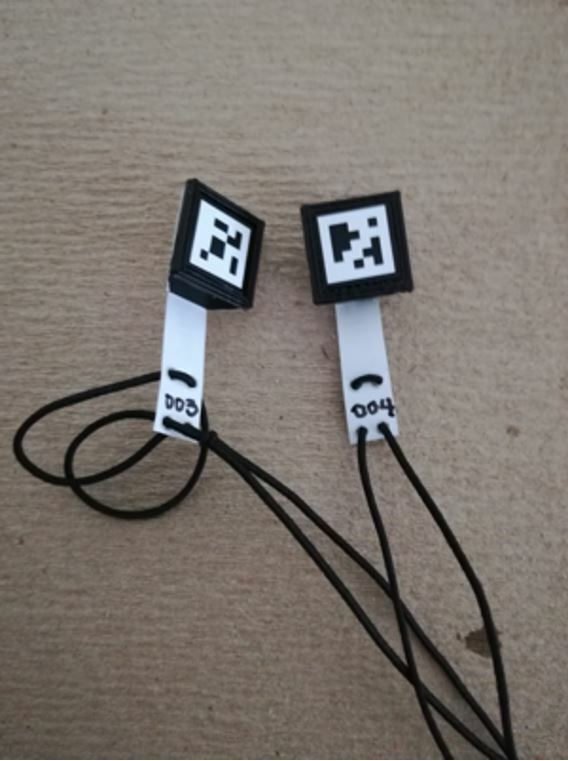 These small radio transponders provide a unique code when they’re close to an antenna. They’ve been widely used to detect, for example, the presence of birds at food sources to infer foraging groups and at puzzle boxes to track the spread of innovations. However, it’s very difficult to obtain fine-scale interactions from these tags though because they provide sequential detections rather than simultaneous observations and because they require animals to come into very close proximity to antennas. Raspberry Pi with a camera module and budget heat guard attached, ready to be fitted to the roof of an aviary. One way of collecting data on multiple individuals simultaneously is to capture images of animal groups, such as photos or videos. Images are excellent because they allow the relative positions between individuals to be calculated. Also, they can provide directional and postural information for each individual. If sampled at high enough frequencies (i.e. by taking pictures frequently), they can even provide detailed information about behaviour through the trajectory formed by the positions across consecutive images. Images can be used to study a wider set of behavioural contexts than previous techniques, and at much higher temporal resolutions. So long as the study species is fairly easy to capture in images, the only real limits are computational processing and storage space. However, using images requires being able to identify each individual, which is a major challenge for most species. Some talented researchers have shown that, for some species, differences in the natural colouration patterns among individuals can be used to automatically recognize and track them across different sets of images. This works on a number of species, such as fish, insects, and rodents, but only when they are placed in a very simple and artificial environments. Also, it fails when colouration varies over time such as when birds shift their feathers (imagine studying cuttlefish or chameleons!). To overcome this challenge, several studies in insects have taken quite a different approach: fitting small tags that computers can read from image data to help with automatic identification. Machine-readable tags represent a promising approach for birds. Although previously used with fish and insects, using such tags with birds requires overcoming some challenges. Gluing a tag to an insect is straightforward and harmless, but can this method be adapted to conduct long-term studies on birds? 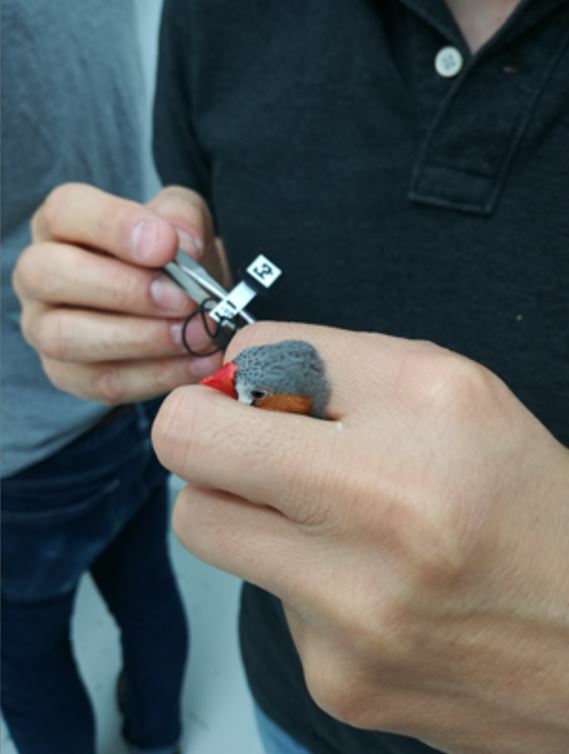 We decided to investigate whether this is possible by testing a range of different ways of deploying these tags onto zebra finches. 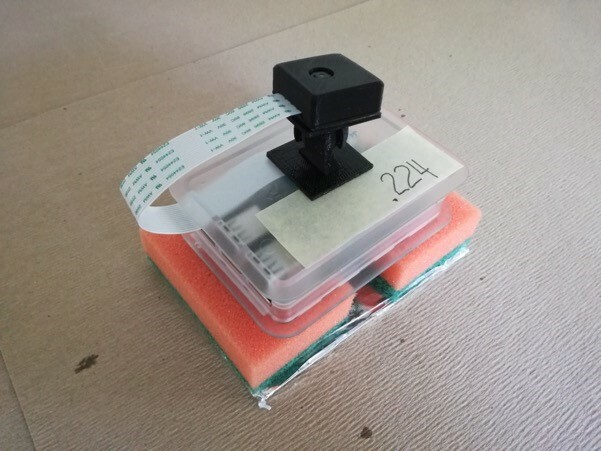 After a lot of trial-and-error, involving many different prototypes, we found a technique that is safe for birds and able to continuously capture data at very high temporal resolution over at least four months. First, we made very lightweight backpacks by folding water- and tear-proof paper. We attached them to the birds using very thin, elastic string. Finally, we added a 3D-printed tray to house the machine-readable code, and glued it onto the backpack assembly. The total weight of these backpacks is a mere 0.27 grams, meaning that it has very little impact on the behaviour of the birds. Our approach opens the door for new and exciting questions about animals’ social lives. Theoretically, it will let researchers track thousands of individuals to be simultaneously, without any variation in the accuracy of data across different group sizes. It’s also capable of collecting data continuously without suffering from any fatigue, a significant advantage over human observers. In our article – ‘An automated barcode tracking system for behavioural studies in birds’ – we show that data capture and processing are easily automated. This allows for very high-throughput experiments (see here for a simple example video) with minimal hardware costs. Our testing also shows that these backpacks can be carried by birds continuously for long periods of time. So studies can span across different life stages (such as development period, pair formation, and/or reproductive periods). This new approach will improve the overall quality of our research as well as many individual aspects, ranging from the ethics of using animals for research through to reducing the potential for incorrect conclusions drawn from very small sample sizes. It will open up new avenues of research by allowing us to track individuals over their entire lives too. The system we propose isn’t limited to studying social behaviour. It also provides opportunities for capturing individual-level behaviours with fine-scale details, such as studying food choice tests or problem-solving. Using this system with infrared cameras and lighting could help to study birds at night or in the very early dawn (it’s been widely suggested that some important behaviours, such as extra-pair copulations, occur before dawn). We’re excited to have had the opportunity to present this technique and look forward to hearing about the many directions that it will take research into the future. To find out more, read our Methods in Ecology and Evolution article ‘An automated barcode tracking system for behavioural studies in birds’. This entry was posted in Methods papers, Second Language Post and tagged Behavioural Ecology, Birds, Group-Level Behaviour, Machine Readable Tags, Ornithology, Social Behaviour, Social Data Collection, Zebra Finch by Chris Grieves. Bookmark the permalink.